A St. Patrick's Day Meal. Oh, And Happy March! Happy 1st day of March, friends. To celebrate, I pulled out my pink trench coat today. 'Cause it's March - and I'm ready to kick the doldrums of winter to the slushy curb and say "hello" to some colors of happy. SO, winter blues be gone. And, welcome Month o' Spring. But, March - well, I suppose it's actually green. Four leaf clover green. So, we had corned beef for Sunday dinner. We love us some good corned beef and cabbage around here. It's one of the Sunday dinner meals that greeted us at Mom's house every week when we lived back East, and every time we go back, I secretly squeal on the inside if I know she's serving it while we're there. So, having her here this weekend, I bought a corned beef. And watched. Ok, so I stalked her 'round the kitchen - asking question after question. Because I've always been intimidated by making a brisket of corned beef. I don't know - somethin' about the spice pack and what the hey is it and how do you know when it's done since it looks the same before and after and what's the right pot to make it in? Excuses, excuses. But, that feeling of "I just don't think I can do it right" is paralyzing when it comes to cooking, isn't it? I mean, intimidation alone will keep me from trying the most appealing of recipes. And, daggone it, I don't want to miss out on making really good food - just because I'm intimidated by it. But, now - Corned Beef and Cabbage, complete with Mom's Parslied Potatoes - will become a regular at our house for Sunday dinner. Because that stalking paid off. I think I can do it. And, because it is ONE FABULOUS MEAL! With St. Patty's Day comin' up, I figured I might not be the only one who's never made it. Or been intimidated by it. And, well - throwing down a corned beef and some cabbage on St. Patty's Day is like - I don't know - undeniably American. Well, as American as spaghetti and meatballs. So, why not invite a few friends over and have a little St. Patty's Day dinner party? 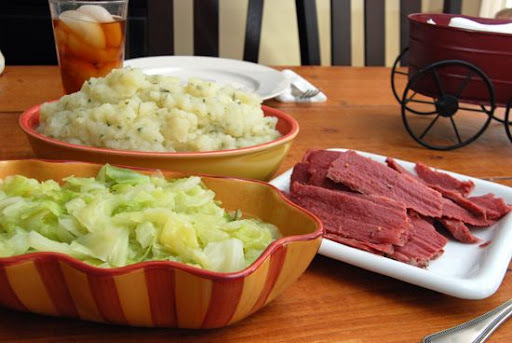 'Cause here are the recipes for the quintessential St. Patty's Day meal: Corned Beef and Cabbage and Parslied Potatoes. And, I know if I can do this, y'all can do it, too. Briefly rinse corned beef under running water. Place brisket in a large pot with lid and top with spice packet. Cover brisket with approximately 1 to 1 1/2 cups water and cook, covered, for 1 1/2 to 2 hours. Note: If making a larger brisket, or making two to serve a larger crowd, cooking time may be longer. 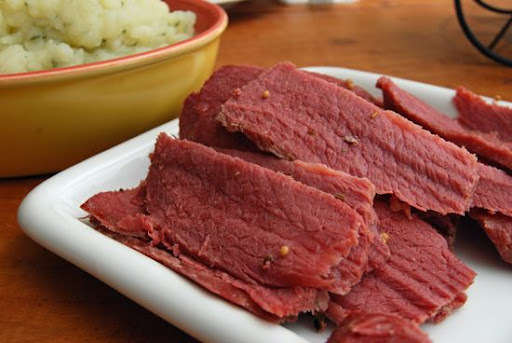 A 2-3 lb corned beef will serve about four people. Remove from oven, and slice against the grain. Serve. Chop up one head of cabbage into large chunks, removing middle section. Place in large pot with 3 cups water and 1 tablespoon of salt. 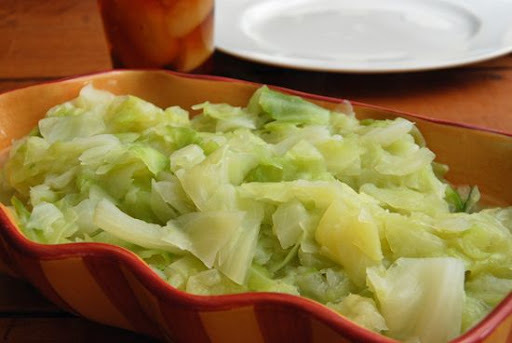 Add 2 tablespoons of butter to cooked cabbage, toss, and serve. In a large pot, bring 4 quarts of water and 2 tablespoons of salt to a boil. Meanwhile, cut the potatoes into 1 1/2-inch cubes and add them to the boiling water. Bring the water to a boil again, lower the heat and simmer uncovered for 10 to 15 minutes, until the potatoes fall apart easily when pierced with a fork. Drain most of water from potatoes, leaving about 2 cups of water in with potatoes. Continue to cook potatoes on low heat, stirring occasionally. As you cook the potatoes, you'll notice them beginning to break down. 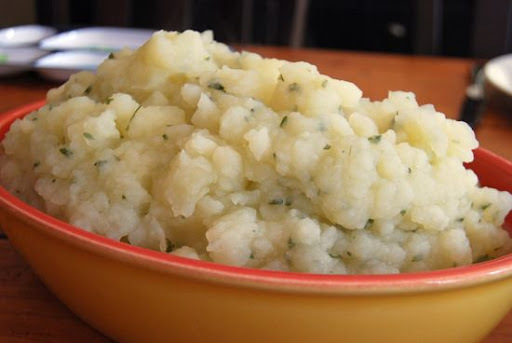 Continue cooking, stirring until potatoes have absorbed most of the water. Add butter and parsley. Mix until butter has melted. you totally rock out the pink coat! So, you're pulling out your pink trench coat, and I'm looking out the window at an incredible winter wonderland here in the South. It's snowing hard and we're expecting 5-8 inches overnight, and since Brett won't be going to work in the morning (yes, things shut down here when it snows even a little bit) we'll be taking Elizabeth outside for her very first experience with the fluffy white stuff. Hopefully the snow will be wet enough for a snowman. Can't wait!!! Thanks for the recipe....would you believe I've never had corned beef?? First--- You look fab in that pink trench. Fab. And the dinner looks ALMOST as fab... :) (Couldn't have dinner looking better than friend.) Perchance will some micro brew beer be making its way to your St. Patty's table? 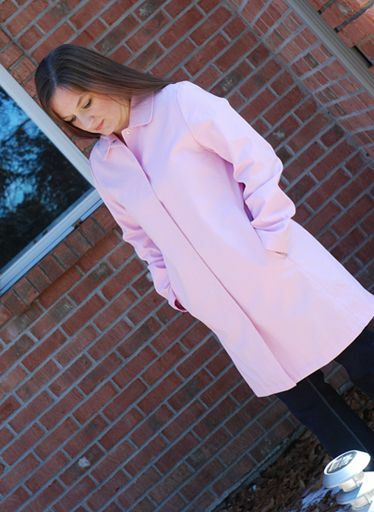 Pink trench...oh so cute...oh so you!!! OK, first: totally beautiful picture of you in the pink coat. Jason must have swooned when he saw the pic (of course, he probably took the pic, but you know what I mean). Your so pretty in pink:-).....can NOT wait till Spring!! !